As the closest planet to Earth, Venus is a relatively easy object to observe. However, many mysteries remain, not least the super-rotation of Venus' atmosphere, which enables high altitude winds to circle the planet in only four days. Now images of cloud features sent back by ESA's Venus Express orbiter have revealed that these remarkably rapid winds are becoming even faster. Europe's first mission to Venus, Venus Express was launched from Baikonur Cosmodrome on 9 November 2005 on a Soyuz-Fregat launcher. It was inserted into Venus orbit on 11 April 2006. 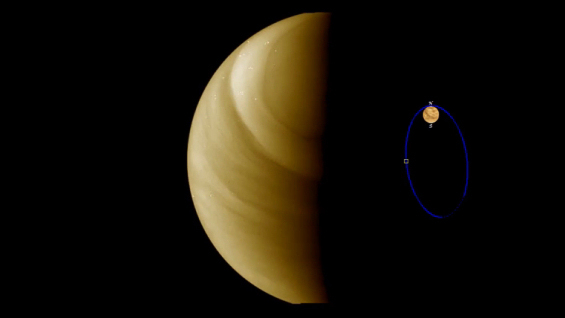 Venus Express orbits the planet in a 24 h period polar orbit. Its payload includes a combination of spectrometers, spectro-imagers, and imagers covering a wavelength range from ultraviolet to thermal infrared, a plasma analyser and a magnetometer. The observations described in this article were carried out using the Venus Monitoring Camera (VMC; principal investigator W. Markiewicz, MPI-Ae, Katlenburg-Lindau, Germany). The VMC is a wide-angle multi-channel camera that takes images in the near infrared, ultraviolet and visible wavelengths.